According to Foxtrot Alpha, Israel has just sent sixteen AH-1 Cobra helicopter gunships to Jordan, to fight the Islamic State and the growing threat of terrorism in that area. This is a rather daunting showcase of how much the neighboring states are actually perplexed by the issue of attacks within their borders, thus once sworn enemies are now helping each other in ways like this. The deal was set and done months ago, with the reveal for the public happening right now. The helicopters have been refurbished, upgrades were made, done by U.S. contractors on site according to the source in question. 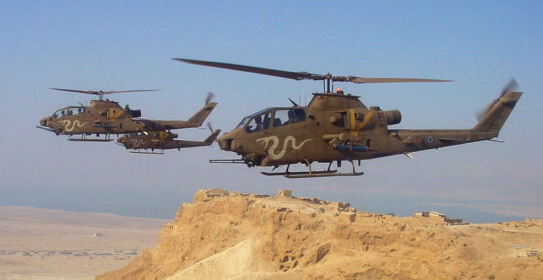 The AH-1 “Tzefa”served for decades with the Israeli Defense Forces. It was phased out when IDF included the newer, more potent and dangerous Apache AH-1 birds, all happening with the modernization Israel is adding to their fighting forces all the time. On the other hand, the AH-1 is an older helicopter by all means, but its still a potent machine. It may come from a different day in age, but its still a scary opposition for most armor units, enemy soldiers and rather perfect for anti-insurgency use as well. The AH-1 helicopters, when received by the Jordanians, will be used to stop the flow of Islamic State men and material, all coming to Jordan and Israel from Iraq and Siria, seriously improving their border patrol and military abilities overall. Jordan already flies the AH-1 Cobra, but the addition of the sixteen more helicopters from Israel will really improve their odds against this enemy force. On the other hand, we’ve seen Jordanian pilots attacking targets all over the middle east, helping the fight against the Islamic State alongside American, French, British and other air servicemen. It still remains to be seen what kind of impact these aicraft will make, but undoubtedly, they will be utilized rather regularly now.